As the seasons change and kids go back to school, outdoor activities start to become indoor activities. This prompts central Indiana homeowners to be more aware of their indoor air. • According to the Environmental Protection Agency (EPA), indoor air is two to five times more polluted than outdoor air. • Indianapolis is ranked 9th worst among cities in the U.S. for year-round particle pollution. When polluted indoor air and high particulates in Indianapolis are coupled with ragweed allergies increasing in the fall, air quality takes a significant nose-dive and can exacerbate feelings of fatigue and sickness. To combat these indoor air quality issues, many Homesense clients have turned to air purification products that combine increased filtration with near hospital-grade air cleaning technology. This helps make their home a refuge from pollutants. 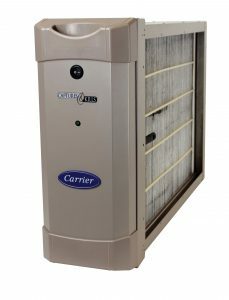 It is easy to determine if the Carrier® Performance Air Purifier is the right fit for your home. Homesense offers a complimentary air quality assessment and estimate. They can usually have a new system installed within three days of that appointment. If you are interested in cleaner air for your home, contact Homesense at 317-670-0171 or visit TrustHomesense.com.